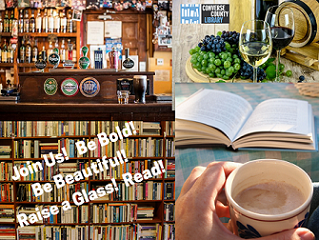 We are excited about our new book club, Book & Brew. The idea is to meet once per month or so, in a different watering hole/coffee shop in town, and discuss fabulous books. So, come on out, meet some new people, see what everyone’s reading, and let’s put our heads together (and raise a glass or two!). 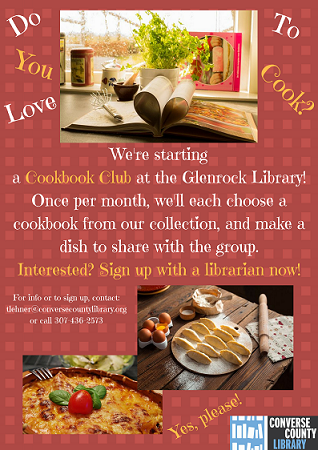 Join us at Food For Thought Cookbook Club at the Glenrock Library! Use a library book to find the perfect recipe, then create a dish to share with the group! Each month we'll have a different theme to inspire us to try a variety of new recipes. 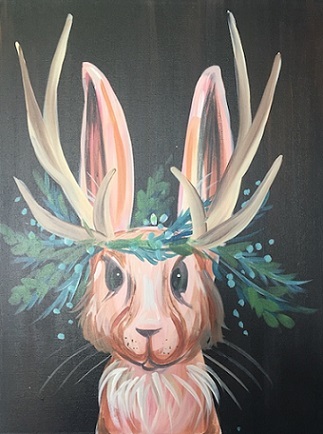 Keep your eyes on our events page to find out when we'll be partnering with Artisan Alley to do painting! Painting with step-by-step instructions from our guide, we have a blast listening to music, enjoying each other's company, and creating our own work of art! No password is needed to connect to our wi-fi, just look for the one labeled as Library and connect your personal device! Need to use a computer or to print something? No worries! Patrons and Guests alike can access our computers for 90 minutes a day. Please inquire about a time extension if you are working on projects for work, school, or job searches! Did you know that adults can check out a laptop for in-library use? Stop by the 1st floor service point to pickup a laptop. Photo ID and library account in good standing are required. Faxing is available for 50¢ per page. Faxes to toll-free and local numbers are without charge. International faxing is not available. Scanning documents to email or USB is available free of charge. We have a notary on staff at each of our library branches. The availability of notary services depend on staff scheduling, but this service is free of charge. Can't find the item you're looking for? We offer Interlibrary Loan service for $3 / item and can request the item to be lent to us from another library. Planning an event and need a place to hold it? Ask us about the options available for reserving one of our rooms. Paperwork is required for each event and a $50 deposit against damages ($150 if food/drink are included in your event). Check our website, Facebook page, or our printed calendars for more details about the wide variety of programming we offer! The Wyoming State Library provides a wide-range of databases for research, learning languages, auto repair, e-books, e-audiobooks, and other resources at gowyld.net In-library use will give you access to all databases, or you can access most from home by logging in with your WY library card number and PIN.